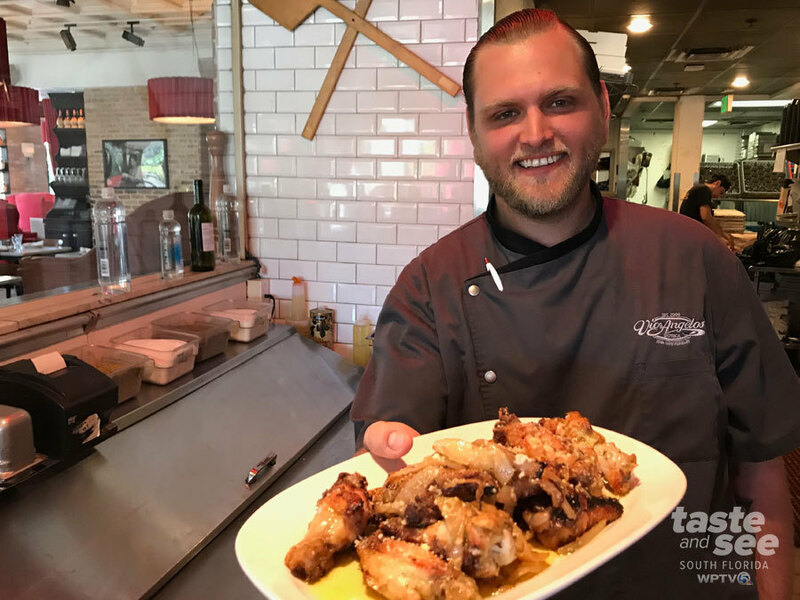 Kelley Randall, executive chef at Vic & Angelo’s located in PGA Commons, has a three-day process before he serves his Coal Oven-Baked Sicilian Chicken Wings to guests. These wings were outstanding because the meat fell off the bone, and all the flavors exploded in your mouth. After we had filmed this segment, I was supposed to take some of the wings back to share with co-workers at the station, but I ended up eating them all myself! On the first day, Kelley creates a marinade by blending all the ingredients together and refrigerating overnight to let the flavors meld (see recipe below). The second day starts with washing the wings. Kelley says, “It’s vitally important that you wash the wings. You want the flavors to be bright and clean.” Then you toss your wings in the marinade. “Make sure every side is coated evenly,” Kelley advises. Refrigerate the wings overnight to let the marinade soak in. The third day is when you start cooking your wings. Kelley starts by spraying a baking sheet with canola pan spray to keep the chicken wings from sticking. Place 12 jumbo wings on the baking sheet and place it in the oven. “You cook them low and slow at 250 degrees for 1-1/2 hours,” Kelley says. The chicken wings should have an internal temperature of 165 degrees. They should still look a little undercooked and opaque. Top with caramelized onions (sautéed down with sugar and water; cooked low and slow). Then place the baking sheet back in the oven for 15 minutes at 500 degrees (at home, you can use the broil feature but keep watch, the wings could be ready in as little as five minutes). Toss the wings with a pinch of fresh rosemary, a pinch of chili pepper flakes, two pinches of salt unfiltered, two tablespoons of extra virgin olive oil, and a 1/2 cup of Parmesan cheese. Coal Oven-Baked, Parmigiano Reggiano, Caramelized Onion, Rosemary, and Crushed Chili Pepper.